Temprecord has developed several reader interfaces to fit just about any customer's need. RS-232, USB, and Palm Pilot interfaces allow versatility, whether in the office or looking at real-time readings in the field. 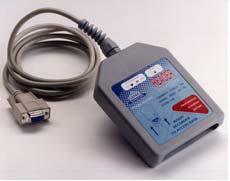 Existing RS-232 Reader Interface is fully compatible with the new software and firmware. USB compatible Reader Interface is for use on most any computer. USB drivers are automatically loaded during TRW (Temprecord for Windows) installation. This reader provides unmatched portability. Made to function with all styles of Palm, this reader allows for real time functionality such as viewing graphical data points or allowing start/stop functionality in the field. As one of the most feature-rich and powerful data logger software applications on the market, TRW (Temprecord for Windows) harmonizes power with ease of use.